China and the United States should join hands to work for balanced trade and address other economic irritants, Vice-Premier Wu Yi said yesterday. "Problems and contradictions emerging in the development of China-US trade and economic relations should be handled properly," she told the opening ceremony of the second round of the high-level US-China Strategic Economic Dialogue (SED). "We must seek measures to address the problems at home first rather than blaming or pressuring the other side, which is of no help at all and will make the situation more complicated." In what appeared to be a clear message to US legislators threatening to slap penalty tariffs on Chinese imports unless the yuan were revalued substantially, she said: "Politicizing trade and economic issues is absolutely unacceptable". "We're willing to take effective measures together with the US side to address bilateral trade imbalances," Wu said, adding these measures include increasing imports from the United States by China and raising US exports to China. She also suggested the United States enlarge exports of civilian high-tech products and technologies to narrow the trade gap. 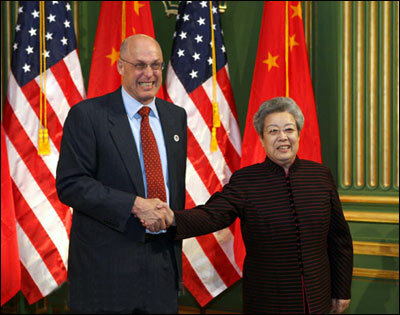 Echoing Wu, US Treasury Secretary Henry Paulson said the two sides must "maintain a partnership, and engage in this process to solve what may seem unsolvable". He said: "We both face challenges of domestic protectionism and questions about the merits of trade and globalization. There is a growing skepticism in each country about the other's intentions The purpose of this on-going dialogue is to have candid discussions and find ways to ease, rather than increase, these tensions." Wu and Paulson lead delegations each comprising of more than a dozen ministers in charge of trade, environmental protection, energy, innovation and finance. They will discuss a wide range of sticking points in the two-day meeting. They include rebalancing bilateral trade, opening services markets (financial and non-financial) to each other, facilitating investment and clean-energy cooperation. A dialogue mechanism jointly initiated by President Hu Jintao and his US counterpart George W. Bush, the SED serves as an overreaching framework for productive economic dialogue and economic relations. The opening round was held in Beijing last December. Members of the Chinese delegation will also meet US lawmakers, some of whom threaten retaliatory legislation unless China agrees to bigger, faster steps to address trade and currency imbalances. Wu is also scheduled to meet Bush tomorrow. China's central bank announced last Friday that it widened the band in which the yuan trades against the dollar to 0.5 percent, up from 0.3 percent. Beijing has also announced measures to reduce its trade surplus, such as reducing tax rebates and levying export taxes on more categories of polluting or resource-intensive products. In another development, a Chinese purchasing delegation headed by Vice-Commerce Minister Ma Xiuhong is close to ending its mission in the United States with procurement volume "far exceeding expectations". Ma said the final figure is expected to exceed $20 billion, which shows not only China's efforts to boost imports from the United States but also the potential for increasing such imports. The delegation, which arrived in the United States earlier this month, agreed to buy US machines, soybeans and technology products.